"The accuracy of the downtime reports provided by the Wonderware software solution were so good that even our equipment supplier is using them to troubleshoot its equipment at our plant instead of using manual tracking sheets normally used when servicing the equipment." Pretoria, South Africa – As summer rolls around, thoughts of barbeques and family get-togethers come to mind. And what would a good hot dog or hamburger be without a cold soft drink to quench a hot summer thirst. For soft drink makers, prepping for this busy time of year entails reviewing manufacturing lines to ensure they are operating at peak performance. The challenge of commissioning a new packaging line in time for this annual summer run on soft drink products can be daunting. 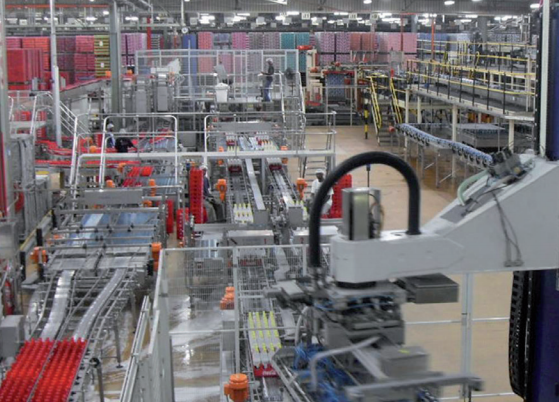 But not for Amalgamated Beverage Industries, a division of South African Breweries (SAB), which chose to implement a new manufacturing line based on Wonderware automation software from Schneider Electric Software Operations Management. Amalgamated’s main business goal was to accelerate production of its packaging line which included tracking machine performance parameters, reducing manual data capture, improving the accuracy of measurements and establishing reference points to better evaluate the reports from OEMs regarding performance of its machinery. Amalgamated’s machine OEM suppliers are responsible for managing the performance and commissioning of their equipment until final implementation of the manufacturing facility. Another important objective specified that the project was to serve as a ”proof of concept” for the effective implementation of PackML (Packaging Machinery Language) standards, which are an open system of guidelines used in the design of automation machinery. The PackML standards were established by the Packaging Workgroup arm of the OMAC (Organization for Machine Automation and Control) group, a consortium of automation and manufacturing professionals dedicated to supporting the machine automation and operational needs of manufacturing. “Without access to valuable process data it would be difficult for us to evaluate the statistics which are designed to assist the company with determining performance improvements and ascertain what part of the project yielded the most value,” said John Coetzee, SAB Business Systems Manager of Manufacturing. Amalgamated worked with system integrator EOH Mining and Manufacturing (EOHMM) which provides fully integrated operations solutions, MES, enterprise integration and intelligence solutions to the mining and manufacturing industries in Africa. EOHMM developed and managed the project parameters including compiling the user requirements and specifications, developing and implementing the full application creation of performance reports, managing factory acceptance testing, commissioning the system, and training users and the technical team on how to manage and maintain the application. “We took a collaborative engineering approach involving our process control manager who provided input on process and procedures, the SAB Manufacturing Systems division which consulted on design guidelines and standards, and EOHMM for management of all the engineering aspects. This collaboration of efforts worked very well in successfully implementing this project,” Coetzee said. The greatest challenge in the software project was the fact that it was being implemented at the same packaging line it was to monitor while it was being commissioned. During commissioning of a new factory line, all focus and effort is centered on this process. However, Amalgamated was challenged to implement both the hardware component and the software simultaneously. Normally, the hardware architecture of the line is implemented first, followed by the software -- Amalgamated wanted both completed in tandem. To successfully achieve the company’s objectives for leveraging existing SAP processes, conforming to the PackML standard and capturing downtime data, Amalgamated selected an Schneider Electric Software Operations Management solution using Wonderware software. The company implemented the Wonderware MES/Performance, Wonderware System Platform, Wonderware InTouch HMI, Wonderware Information Server and Wonderware Historian applications. The combination of these powerful software tools enabled Amalgamated to achieve its objective of accelerating the production of its soft drink manufacturing line during peak demand cycles. The foundation of the Amalgamated system is the Wonderware MES/Performance software built on the Wonderware System Platform. The performance software collects, tracks and communicates key performance indicators in real-time. This information is then delivered to operators who can take immediate action to correct a problem on the line. Built on Wonderware System Platform, the performance software is highly scalable for all SCADA, supervisory HMI and MES applications. Wonderware InTouch HMI is used for visualization of manufacturing operations. Sophisticated graphics are displayed on operator screens showing standardized PackML information to assess the operational efficiency of various machines on the packaging line. To prevent operator confusion, only machine Overall Equipment Effectiveness (OEE) information is shown, although the full OEE dashboard is available on request. In addition to OEE dashboards, any specific portion of the HMI screens can be customized to display various information such as downtime, Pareto charts, line stoppages including duration and frequency, job progress, and live or historical performance trending. “Because the downtime reports provided by the Wonderware system are so accurate, Amalgamated’s machine OEM is using them to troubleshoot its equipment instead of using the manual tracking sheets normally used,” Coetzee said. With the implementation of Wonderware Historian, Amalgamated has access to a wealth of historical information from its production processes. As a high-performance, real-time database, Historian is able to collect a wide variety of plant data, at full resolution and very high data rates. This ensures that decision-makers at all levels have the information needed to drive vital productivity improvements. This information is shared throughout the organization using Wonderware Information Server which aggregates and presents plant production and performance data over Amalgamated’s intranet. With the help of Wonderware Historian and Wonderware Information Server, Amalgamated has access to accurate downtime and stoppage reports, can more accurately estimate reject counts and determine the number of crates on the line. The elimination of manual logging of these activities has significantly increased the efficiency of the production facility by making the information readily available for business analysis. Today’s MES implementations are a far cry from the “big bang” approach of the past. Wonderware software solutions can be installed gradually with success measured at each stage of the implementation before contemplating the next step. With adherence to standards such as PackML, manufacturers are assured that all pieces of the puzzle will actually fit together and operate effectively over time. Source: This case study was first published as: Schneider Electric Software Success Story "Amalgamated Beverage Industries"